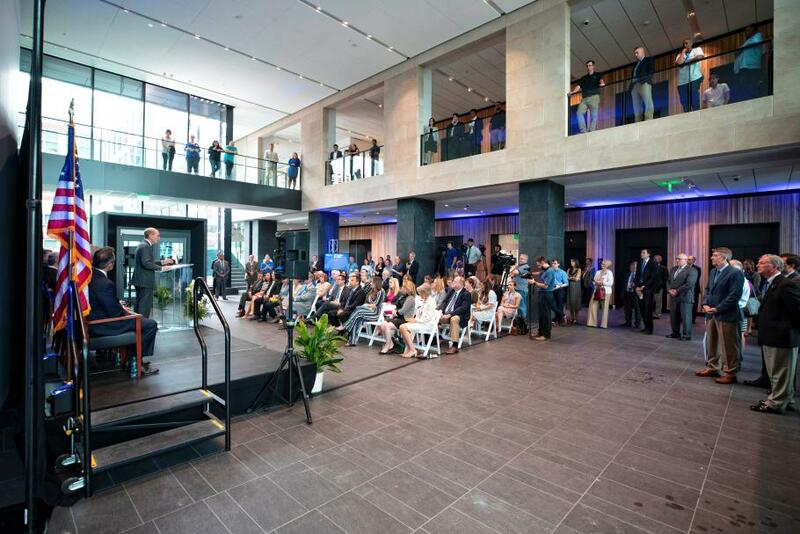 UK President Eli Capliouto addresses Grand Opening attendees in the Research Building 2 central atrium. Photo: UKentucky. 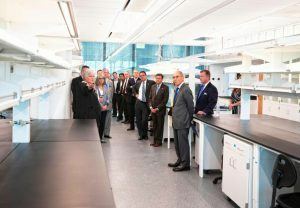 The University of Kentucky in Lexington has opened a new state-of-the-art, multidisciplinary research building designed to promote collaborative approaches to researching public health issues. Designed by HGA in partnership with Champlin Associates, the 300,000-square-foot Research Building 2 (RB2) brings together multidisciplinary research teams in basic biomedical research, health services, public health, behavioral sciences, bioinformatics and big data, economics, and engineering to address the state’s most pronounced health disparities, including cancer, heart disease, opioid addiction, diabetes, and other chronic diseases. 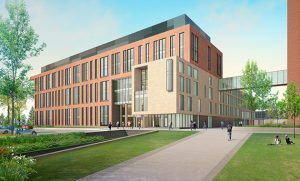 Located in the heart of UK’s biomedical research campus, the six-floor facility includes two-thirds wet labs and one-third dry labs and computational space for 500 researchers, postdoctoral scholars, and graduate and undergraduate students. The building is connected to the Biomedical Biological Sciences Research Building (BBSRB) adjacent to the Lee T. Todd, Jr. College of Pharmacy Building, creating an interconnected complex of research buildings focused on health, pharmacology, basic research, and behavioral sciences. VP for Research Lisa Cassis leads a tour of the labs. Photo: UKentucky. Laboratories are designed as neighborhoods within an open plan concept to promote synergy between disciplines, enabling researchers to share insight and data from different perspectives. Design features include an open lobby to foster interaction between researchers and community participants, visible stairwells to encourage physical activity, and a café serving healthy food to promote nutritious eating. For more information, visit the University of Kentucky.